Forced air heating is one of the most common methods of keeping a home warm and cozy in cold weather, but even if your home uses one of these systems, you might not know exactly what it is or how it works. The more you know about forced air heating, the better you’ll be able to maintain your existing system or choose a new one. These systems are called “forced” air because they use an air handler with a motorized fan to push the air they heat or cool out to your rooms. A forced air heating system is often paired with an air conditioner that uses the same air handler and ductwork as the heating system. In contrast, radiant heating systems typically use either metal radiators or underfloor heating pipes to radiate heat into the room much like the sun radiates heat to the Earth. Another type of system uses electric baseboard heaters in each room located near the floor along the baseboard. Unlike forced air systems, neither of these systems move air. Blower fan – When the furnace kicks on, the blower fan starts up and begins drawing air into the system. This air passes through a filter that removes debris such as pollen and pet hair, then moves on to be heated. Heat source – A fuel-burning furnace burns natural gas, oil or propane to produce a flame that provides heat. An electric furnace uses electricity to heat a metal heating element. Heat exchanger – In a fuel-burning furnace, the heat exchanger transfers heat from the flame to the air and holds back combustion gases such as carbon monoxide. 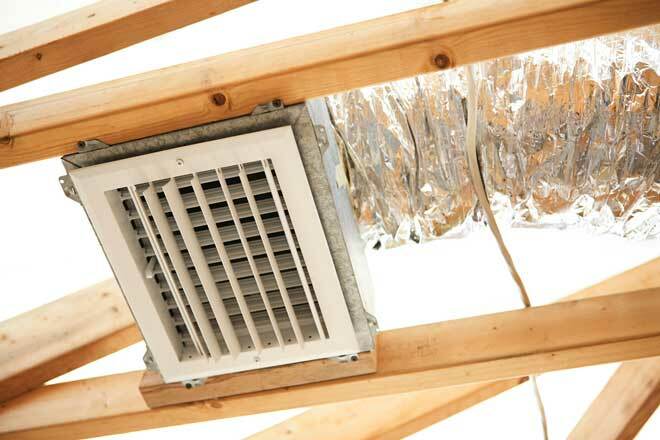 Air ducts – Once the air is warmed, the blower fan pushes it out into the air ducts. Air ducts are tubes of stainless steel, fiberglass ductboard or flexible ducting that carry heated or cooled air out to different parts of your home. They can be located in your ceilings, walls, and floors as well as in your attic and basement. Air registers – These are the openings where the ducts connect with a room’s floor, wall or ceiling to deliver warm or cool air. They’re protected by metal covers with slats or other openings large enough to let the air through. Return air vents – In at least one or preferably several rooms in the house, there will be a hole in the wall larger than the air registers and covered by a metal grille. This is the return air, or cold air, vent the system uses to draw room air back to the air handler for more energy-efficient operation. A furnace isn’t the only type of forced-air heating system. Heat pumps and ductless heating systems also fall into this category because they use a fan to move heated air. A heat pump is essentially an air conditioner that can work in reverse to produce warm air as well as cool air. In heating mode, it doesn’t produce heat, but rather extracts heat from the outdoor air. The refrigerant in this system then moves that heat from the outdoor unit to the indoor unit via copper refrigerant lines. Earlier heat pumps lost efficiency rapidly as temperatures approached freezing. These days, though, you’ll find systems that heat efficiently in temperatures down to -10 degrees or even lower. A ductless heating and cooling system also uses a heat pump to condition your air. Instead of using ducts to distribute the air, though, it uses air handlers mounted on the wall, ceiling or floor. These air handlers blow air directly into the room. These systems give you more control over the temperatures in different parts of the house, and they don’t suffer the energy loss caused by ducts. Any type of heating system can keep your home warm, but forced air systems have some distinct advantages. Quick, intense heat – When you turn on a forced air system, you’ll feel the warmth faster than with any other system. That’s because warm air is blown into your rooms almost immediately. With a radiant system, you’ll have to wait for the radiators or underfloor pipes to warm up. A fuel-burning furnace produces a particularly intense heat because air leaves the registers at a high temperature. The warmth from a radiant system is even and comfortable, but milder. Options for Add-ons – Because all your home’s air must travel though an air handler, it’s easy to filter and humidify or dehumidify your air by installing additional equipment in the system. On the other hand, radiant systems don’t stir up the air and the allergens in it. Ease of installation – If you already have a forced-air system and you’re looking for something more efficient, upgrading to a new forced air system is the most cost-effective choice. While you could switch to radiators or underfloor heating, you’ll incur high installation costs. If you want a little extra warmth in one part of your house, adding a ductless system is often more even practical than extending your ductwork. Forced air heating has its downsides, too. It’s often less energy efficient, noisier, and more likely to cause uneven heating than radiant systems. If you’re planning the construction of a new home, look into the pros and cons of each heating system before you choose. Whether you currently use a forced air system or you’re considering all your options for heating, learning how forced air systems work will let you make more informed choices for heating your home.